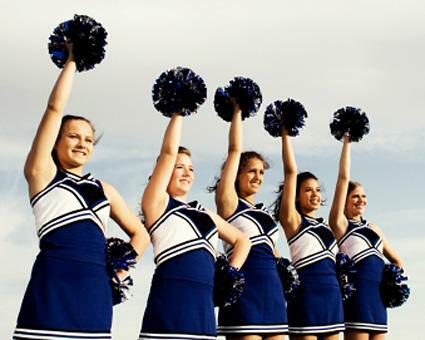 Floor cheers are longer cheers that are meant to be performed at half-time or during game breaks. Although they can be performed at other sporting events, they are most commonly performed at basketball games. The crowd expects a bit more out of a floor cheer, so you'll want to come up with a unique routine that is specific to your school and highlights the athletic skill of the cheerleaders. Try one of these cheers at your next basketball game. They're sure to keep the audience energetic! There are plenty of opportunities for floor cheers during a football game, so pay attention and be ready with one of these. Here is a floor cheer that could be used during a break at a softball game. However, it could also be easily adapted for football or basketball by changing some of the sports terms and actions within the cheer to terms that make sense for another sport. Floor cheers are meant to entertain the crowd during longer game breaks. Depending on how much time you have available, you may want to add dance moves, tumbling sections and even a pyramid that will wow the crowd. This is a good time to show off those skills you normally don't get a chance to use with a simple sideline cheer.